Monash University Baseball Club was founded in 1963, soon after the university opened. A major driving force was Dr Jack McDonell, physics lecturer and warden of Deakin Hall, who had won a full blue for baseball at Melbourne University and played in baseball curtain-raisers to VFL football matches. McDonell became the club’s first president and two of his sons, Ken and Russell, later played for the club in the early 1970s. Players in the first couple of seasons included a core of eight who had played baseball at Melbourne High School. In its first season the club competed in the D grade of the Victorian Baseball Association, finishing fourth and also making the semi-finals of the Australian Universities championship (known generally as Inter-Varsity and now as Uni Games). The club’s earliest diamond was on a lawn that is now a bitumen carpark between the University Offices and the Sports Centre. Its clubhouse was shared with the campus religious centre on the site now occupied by the Faculty Club! In its third season, the club gained promotion to C Grade after finishing runner-up in 1964 to Glen Waverley RSL (soon to become Waverley). Don and Alby Price, Russ Worthy and Steve Engel were early players of prominence, with catcher Engel becoming the club’s first player to win All-Australian Universities selection at the 1964 Inter-Varsity. 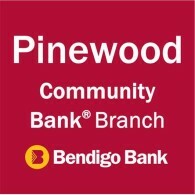 The last half of the 1960s saw the club consolidate its place in C grade and establish three teams. It moved to its current field. The club’s often scurrilous weekly newsletter Farmers was founded in 1966 as a fortnightly. On-field performance was variable, the club typically finishing middle ladder but on an upward trajectory. Inter-Varsity performances improved from a winless carnival in 1964 to a high of 5.5 wins in seven games in 1971. The club narrowly lost the 1970 C1 grand final to Moorabbin, then finished as minor premiers in division two of the VBA’s experimental summer comp in 1970-71 before stumbling in the finals. In 1972 the club broke through and won its first flag, the C1 premiership, with a 9-7 win over Caulfield. The grand final turned on a home run hit by pitcher Vic Delosa, with the opposition muttering darkly about the wrong ball being used. 1973 was a momentous year for the club. Making its debut in B grade, equivalent to today’s Division Two, the club stormed into the finals on the back of superb pitching by law student Murray Hill, who shared the VBA’s B grade MVP award despite spending the first two games in the seconds establishing his credentials. The club got a proper diamond built, playing in the interim on grass in what is now the rightfield corner. Sadly, the eternal malaise of university clubs struck the following season, with many players moving on. Murray Hill was recruited by Division One club Sandringham to become Monash’s first home-produced star, forming a fine pitching partnership there with Australian pitcher Butch Wonnacott. The club’s slide in the mid-seventies was arrested by a brilliant recruiting coup engineered by new president Des Cook and secretary Brian Mukhtar. Seizing on the shift to summer baseball by most clubs, Cook and Mukhtar recruited ex-Victorian pitcher Alan Tanner to coach the club, correctly guessing that a top-flight coach would attract up-and-coming young players keen to improve their skills over winter for the summer season. A string of future Victorian and Australian players came to the club to learn at Tanner’s feet. These included Australian players such as Rob Meates, Michael Klinger, David Buckthorpe and David Clarkson, as well as Monash students Andrew Smith (Australia), Andrew Ferguson (Victoria) and Phil Eastman (Victoria). Murray Hill returned, and the club also produced a string of home-grown stars — pitchers Peter Hand and Chris Carter, outfielder Alan McAlister and future Division One hitter and coach Phil Bertrand. In a golden era for the club, Monash claimed the South B flag in the dying VBA Winter competition in 1978, then switched to the powerful Dandenong Baseball Association in 1979, finishing fourth before claiming its first A grade flag the next season. In a classic display of “small ball”, Monash beat Cheltenham 4-1 in a tight grand final on the back of nine innings of power pitching from Peter Hand, four double-plays by a star-studded infield, and a two-out running bunt by Andrew Ferguson to bring in the crucial go-ahead run. 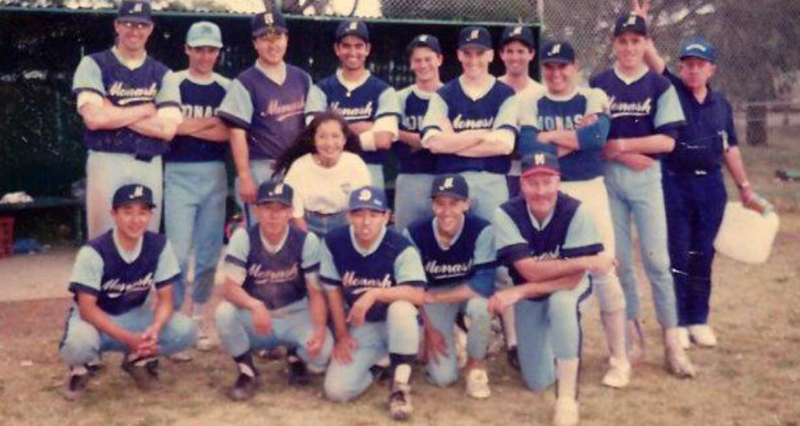 It was the first of six successive A Grade titles between 1980 and 1985 as Monash dominated the DBA, Victoria’s strongest winter league at the time. Only one title eluded Monash — the InterVarsity championship. Club secretary Brian Mukhtar obtained a print-out of all 12,000 Monash students in the early 1980s and went through it manually to put together the best Inter-Varsity side yet fielded by Monash. But after cruising through the round-robin matches, it went down 13-2 in the final at Straw Field to the unfancied hosts, Melbourne Uni. With the retirement of Alan Tanner as club coach in 1986, the club lost many of its stars and went into a lean period, this time arrested by a new administration under Nat Crafti which recruited a new coach, Ron Carothers — then the most exciting player in Australian baseball. Carothers led the club to its last A Grade flag in 1993. Under Crafti’s energetic presidency, the club got proper clubrooms built, introduced a women’s team and took a determined shot at summer baseball. Monash climbed to summer Division Two before the VBA’s insistence on four teams put paid to any Division One aspirations and the club’s stronger summer players were forced to go elsewhere to play at the elite club level. The noughties saw mixed fortunes for the club. Going through five coaches and several presidents took its toll on club stability, with the A-grade side going winless through 2008. The women’s team were a beacon in an otherwise dark time, as they made several grand finals, but were unable to win against sides packed with state representatives. A move to B-grade in 2009 saw the mens teams’ on-field fortunes improve and finally in 2010, two years after dropping to B-grade and under the coaching of Michael Hunt, both B1 and B2 sides triumphed with hard-won and well deserved premierships. Seasons 2009 and 2010 also saw Monash claim an Australian, perhaps world first, with two women taking the job of the club’s no.1 pitcher in the Firsts. In 2009, state women’s team curve-baller Vic Brown won the club’s MVP award, pitching the club to a middle-ladder finish in a very competitive B Grade. Then in 2010, Australian women’s team pitcher Kathy Welsh pitched the club to the B Grade flag, also taking out the club MVP award and going the full nine innings in the 9-3 grand final win over Chelsea. 2011 proved to be a year of new challenges, as the club changed to the deeper Melbourne Winter Baseball League which enabled it to resume University rivalries against Melbourne and Latrobe Unis. 2011 also saw Monash finally break its Inter-Varsity jinx, going unbeaten through the 2011 IV tournament at the Gold Coast, before winning a dramatic Gold Medal game, 7-6 against Griffith University on a Jack Dunn walkoff home run. A 48 year drought was finally broken. Apart from brief periods in the late 1970s, late 1980s, and 2009 when it fell back to two teams, the club has fielded at least three mens’ teams every winter from 1965 onwards. A growth spurt in the early 1990s saw the club reach five winter teams for a couple of seasons, and even four summer teams in 1992-3. The club’s fiftieth anniversary season sees it back on a high with five men’s winter teams, two summer teams and a women’s team, all very competitive in their respective grades.